Hey Gary. Thanks for taking the time out to talk to me about the newest Star Trek movie, ‘Star Trek Into Darkness’. Thank you, Matt! Well, basically, Kirk, Spock and the rest of the Enterprise gang come to rescue me and my fellow Nibirians from the imminent destruction of our planet by a massive volcano and it goes on from there… Hey, you gotta go see it for yourself! Early in 2012, Headquarters Casting was posting for some very hush-hush project they were preparing for here in L.A. I ignored the posts at first. The character descriptions just didn’t sound right for me. But finally, some time in February, I decided to go down and register anyway. So I registered and forgot about it. Then, I think it was late March when I got a call from them. They said they were looking for someone very specific and asked if I’d be willing to shave my body for the role. They’re both prequels to the original TV series. And both really good, in my humble opinion, though I like ‘Into Darkness’ best. And not just because I’m in this one! I’ve been a Star Trek fan, not a Trekkie per se, but definitely a fan, since the first episode I saw way back in 1967! I was an adolescent kid living in Japan in ’66 when the series started, so I was unaware of it then. But I was reading a lot of Robert Heinlein and was really into sci-fi. We came back to the states the summer of ’67. I spent the “Summer of Love” in Bakersfield, California at my granddad’s place. One day, walking through the empty living room, I switched on his big colour TV – a real treat for me at that time. The first thing I saw was a close-up of the Gorn hissing into the camera! I was immediately hooked. It was a truly amazing experience. And a bit of a roller coaster ride! To start, I had a live cast of my head for the prosthetics – that’s quite a trip in and of itself. Then I was fitted for costume, and contacts, and there was a make-up test with the prosthetics and rehearsal with choreographers and Jeremy and the other Nibirians. Everyone was great, really supportive and helpful. After all that, I got a call telling me that it was decided that I just didn’t look old enough (how ironic is that for Hollywood?!) – I was being cut and they were going to try to find someone to replace me! Well, they didn’t find anyone else they thought was appropriate. And in the meantime, the lead special make-up fx artist, a really cool guy (and an academy award winner!) David Leroy Anderson got busy with his crew and redid my prosthetics. Then I got another call asking me to come back in for a second make-up test. If J.J. gave me the green light, I would be back on and would shoot my first scene. I went in at 4:30 AM to be put into my new make-up – (a 4 hour process) and costume and was taken out to set to see J.J.. He said – I’m paraphrasing here – “That’s what I’m looking for! Now you look like the Elder, before you just looked like another one of the guys!” And the next thing I knew I was on set with a humongous IMAX camera in my face! So, thank you J.J. and David! Let’s talk a bit about you Gary. What made you want to get into the acting industry in the first place? That’s a bit of an odd story. I started pursuing acting rather late. I had taken drama in high school, was even offered the lead in the senior class play. But I turned it down. I studied music at Oberlin and dabbled a little in theatre just for fun. Then went to NYC to pursue my music. While I was there, I ended up working in theatre on the production side. I did act in one play, but that was pretty much it on the acting side. I eventually ended up in LA in 1999. I came out here to continue with my music, and to start a new career in the dot-com industry. About a year later the dot-com bubble burst and I found myself struggling to make ends meet. Then, late in ’02, I had a lucid dream. I have those from time to time. In this one, I was at a restaurant, waiting for my table, standing at the bar having a conversation with some iconic, old-school Hollywood actor. I think it was Gary Cooper. Cooper was much taller and bigger than me. At one point Cooper puts me in a big bear hug and lifts me up so that we’re nose-to-nose, looks me in the eye and says “With a voice like that, you can have whatever you ask for. Use it”. I looked right back and said “I want a job as an actor and I want to do voice overs.” Then I woke up with an overwhelming feeling that I was supposed to pursue a new path as an actor. So I did. Focusing more on acting than voice over. Since then, I’ve studied the craft, helped found a theatre company (then called ART Players, now known as ARTEL), and act whenever I get the chance. 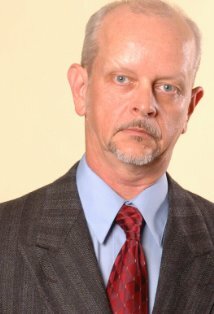 Including a lead role in a film with Faye Dunaway and principal roles in a couple of national commercials. Get the best training you can, the best headshots you can and get out there. Of course, there’s a lot more to it than that, especially with all the new digital technology. It’s a real challenge. But if you decide that’s really what you want, go for it! Well, I already mentioned working with Faye Dunaway. That was cool. It was my first real screen acting gig, a film called ‘The Seduction Of Dr. Fugazzi’. It didn’t get released until ’09, but we shot in ’05! When we finished the rehearsal, Faye made a beeline across the set with her hand extended, shook mine, apologizing for the interruption, and said, “You were so good, I thought you were real!” That really broke the ice for me and gave me the confidence to pursue this crazy business. What I-Pod? I love music – but I got over this whole thing of walking around with music blasting in your ears back in the Walkman era! J.J. Abrams, Ryan Murphy, and Frank Darabont. I love their work. I’ve worked with J.J. and Ryan, and have met Frank. Oh, can I have a fourth guest? I want to add David Lynch to the list! I’d love to be cast by these guys in whatever current or future projects they could use me in – with dialogue! “With a voice like that, you can have whatever you ask for. Use it”. I hope they’re listening – or, um, reading! How about a TV series? ‘Ryan Murphy’s American Horror Story: Asylum’ was fantastic. Intense. And I was a season regular. The Headbanger Inmate. Again, no dialogue, but very featured. That was like an acting master class every day on set. That’s actually where I got to know Zachary Quinto. He’s really cool. I hope to be able to do a scene with him sometime soon. Well, first of all, I am, as they say, “between agents” on the theatrical side. So, I need to find a new theatrical agent. Then, we shall see! I just gave you a list of things I’d like to make happen! Thanks for taking some time to talk with me, Matt. I really appreciate it! Previous Peet Montzingo – (Star Trek Into Darkness – 2013). Next Suzanne Voss – (The Lords Of Salem – 2013).